We've been watching a lot of Pioneer Woman's Food Network show this past week while my daughter has been fighting off a virus of some sort. She loves the cooking shows, and well of course so do I! 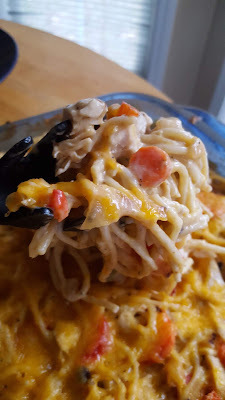 Her chicken spaghetti recipe came up on one of the episodes and I thought that sounded like a great way to use a nice chunk of the roasted turkey we had in the refrigerator (we've roasted another turkey since Thanksgiving - when you buy the turkeys on sale after Thanksgiving, they take up a lot of space in your deep freezer, I needed some of that space back!) I made several changes to PW's recipe - none of us are big fans of crunchy onion and pepper so I wanted these veggies to be sauteed ahead of time. I also wanted more veggies in our dish. Next time I'd add in some mushrooms - fresh or canned - as well. This is a delicious creamy pasta dish, packed full of hearty chunks of turkey and delicious tender veggies. 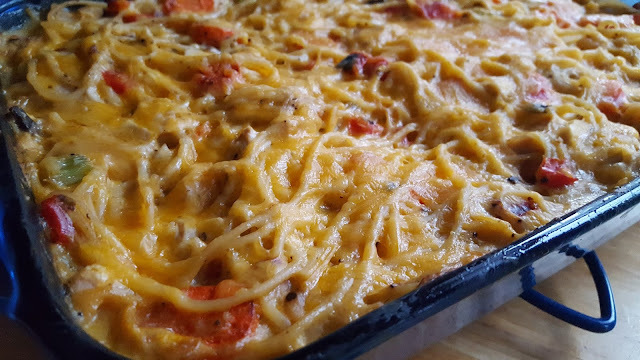 Lightly seasoned and easy to eat - as with most of these types of all in one casserole dishes, I love that you can prep ahead of time, freeze these before baking, and the leftovers pretty much always reheat well. What more can you ask for in a convenient work night meal? Pour chicken broth into a large saucepan and add about 4 cups of water (more if needed) and a splash of olive oil. Bring to a boil. Boil noodles about 10-12 minutes until cooked to al dente. Save cooking liquid. Meanwhile, saute carrots, celery, bell pepper, and onion in a large skillet with about 1 TBS of oil, heated over medium to medium-high heat. Cook until vegetables are slightly tender, with some browned edges, about 10 minutes. Remove from heat. 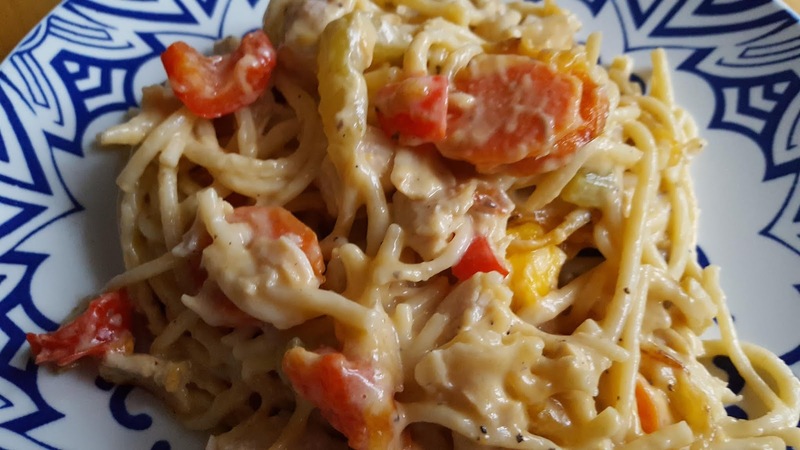 Combine cooked noodles with sauteed vegetables, chopped turkey, cream of mushroom soup, seasonings 2 cups of shredded cheddar and cooking liquid. Stir. Mixture should be a little bit "wet" as liquid will absorb during baking, if your mixture is too dry add additional cooking liquid to achieve desired consistency. Smooth pasta out. Sprinkle remaining cup of shredded cheddar over the top. Bake in a 350 degree oven for 30-45 minutes until heated through, bubbly, and cheese is melted. Serve immediately.